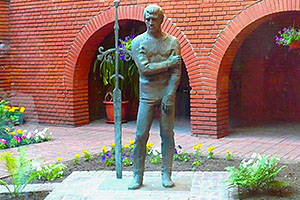 Vladimir Semyonovich Vysotsky (1938-1980) is one of the most outstanding figures of 20th century in Russia and beyond. His works are still studied all over the world. The poet, actor, singer and songwriter was known for singing to his seven-string guitar, a traditionally Russian instrument. He was a cult figure in the Soviet Union. Vysotsky sang about subjects that were on everybody’s mind and the expressed hopes and aspirations of his fellow countrymen in his music. 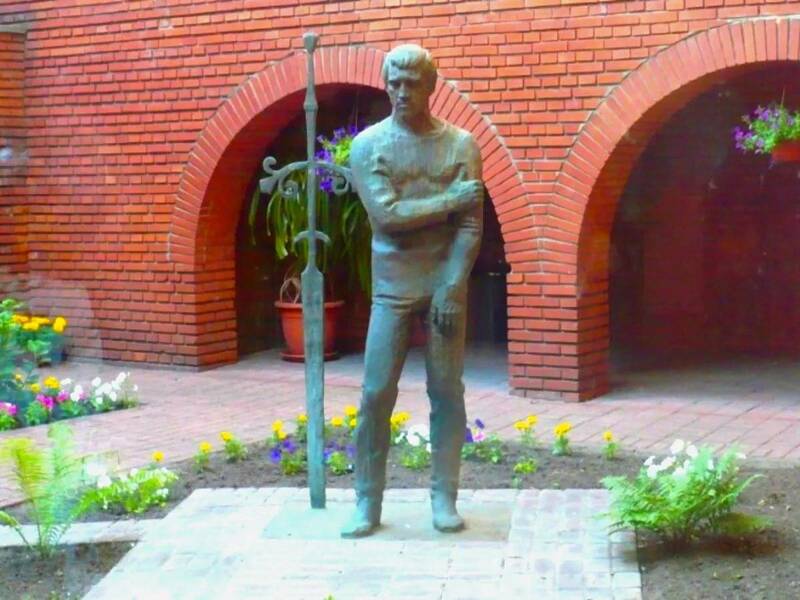 Although he was not awarded any official titles during his lifetime, his inimitable, hoarse baritone was heard in every home, particularly in Moscow, a city with which Vysotsky had close connections. 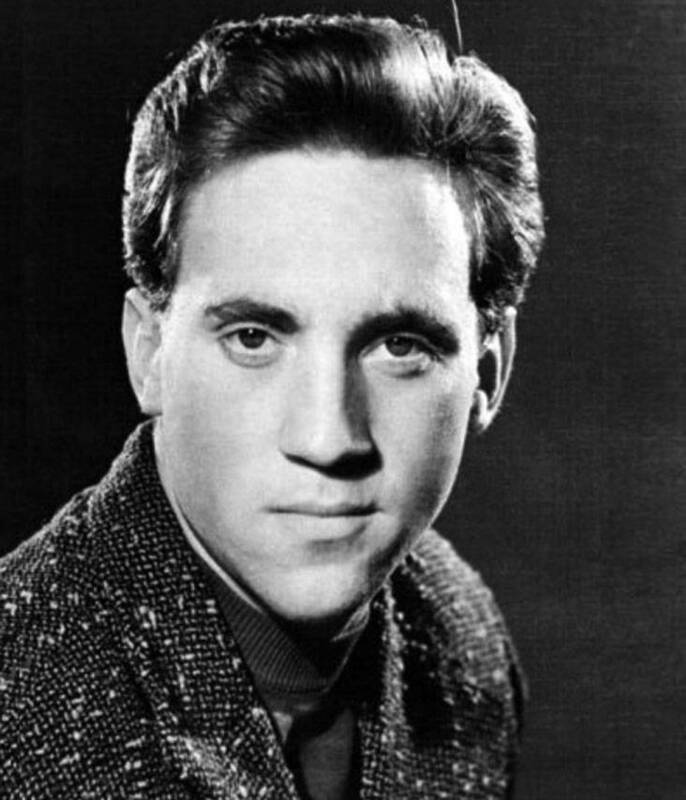 Vladimir Vysotsky was born on the 25 January 1938 in the Moscow maternity clinic No. 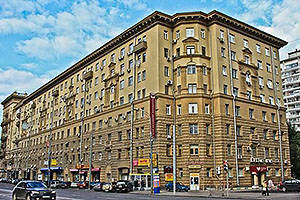 8, located on Tretya Meshchanskaya Street (present-day 61/2, Shchepkina Street). He was born to Semyon Vladimirovich and Nina Maksimovna Vysotsky. 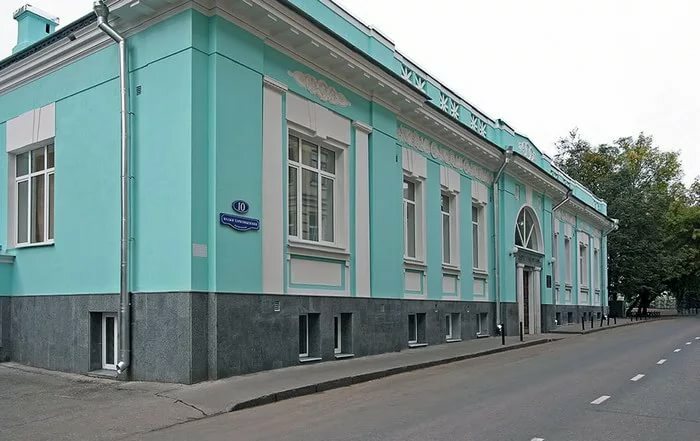 The building where he was born now accommodates the Moscow Region M. F. Vladimirsky Clinical Research Institute (Russian: МОНИКИ имени М. Ф. Владимирского), with a memorial plaque bearing the birthdate of the nationally acclaimed poet affixed to the wall. 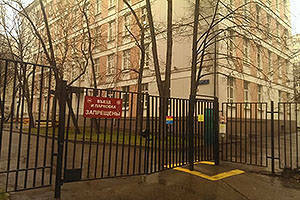 During his early childhood, Vysotsky lived in a communal apartment located at 126, Pervaya Meshchanskaya Street, which he immortalized in his Ballad on Childhood. When World War II broke out, young Vladimir and his mother were evacuated to the Orenburg Oblast, where they spent two years. They then returned to Meshchanskaya Street in 1943, and in 1945, the year the war was over, Vladimir started Grade 1 at Moscow School No. 273, located at 68 c3, Mira Avenue. 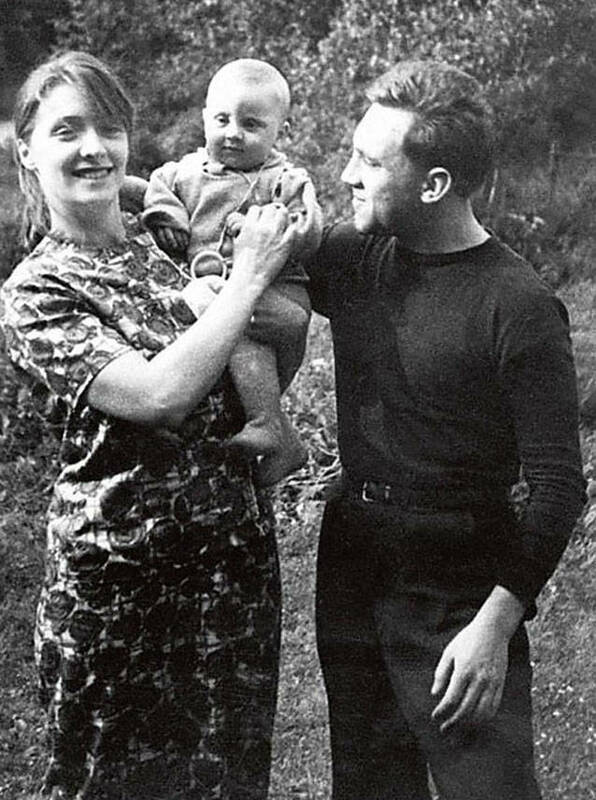 After his parents divorced in 1947, Vladimir preferred to live with his father and his second wife, Evgeniya Stepanovna, whom he called ‘mama Zhenya’. In 1947-1949, the Vysotskys lived in the town of Eberswald in Germany, where Vladimir’s father was stationed for military service. 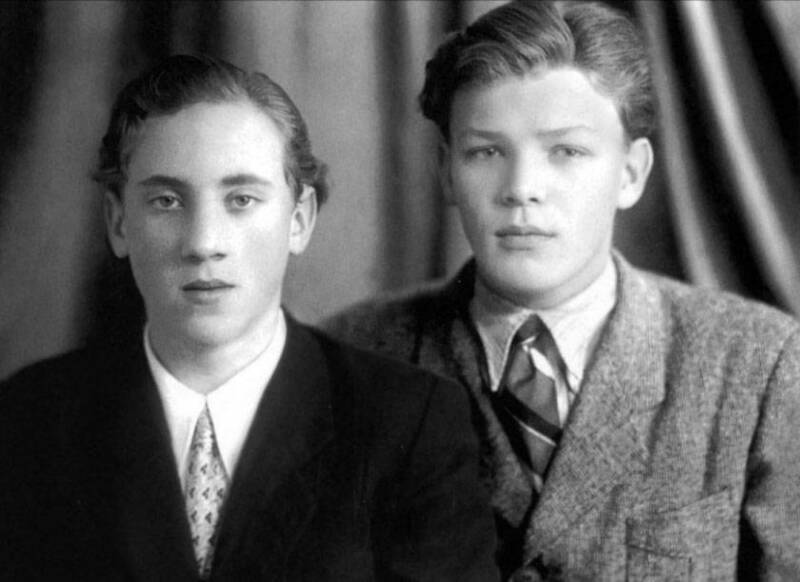 Upon his return to Moscow, Vladimir entered Grade 5 at the Boys’ Secondary School No 186, to which he later dedicated one of his best-known songs, Bolshoy Karetny. 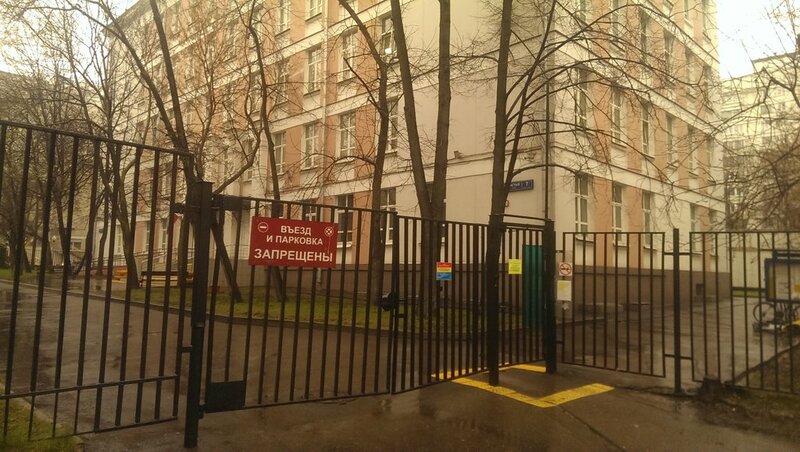 Today, the former school building (10A, Bolshoy Karetny Lane) houses the main site of the All-Russian State University of Justice (Russian: Российская правовая академия Минюста). The Vysotskys lived nearby, at No. 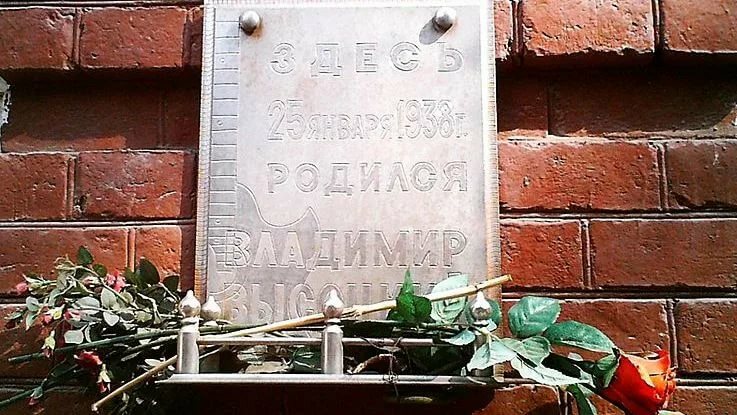 4, 15, Bolshoy Karetny Lane, where a memorial plaque created by R. Gasparyan is located today. 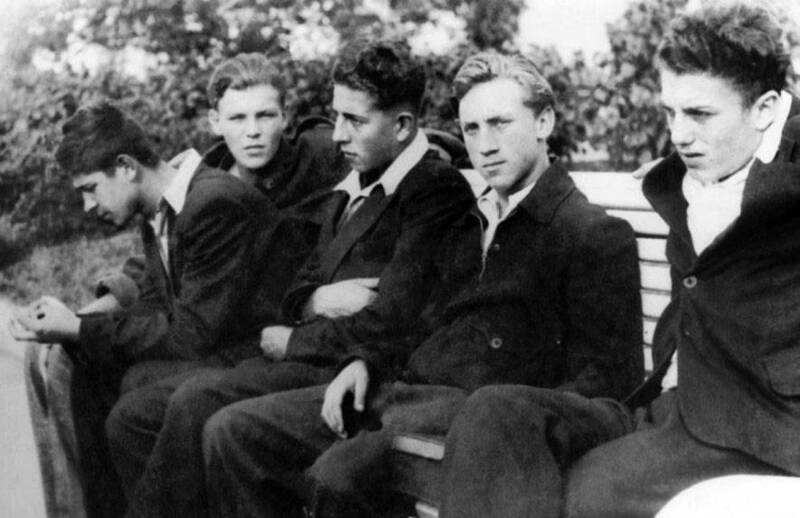 At the age of 15, Vysotsky joined a drama course led by Vladimir Bogomolov, an actor at the Moscow Art Theatre. However, his family thought it important that Vladimir choose a “serious profession”, which is why he was enrolled in the Faculty of Mechanics of the Moscow Kyubyshev University of Civil Engineering (Russian: Московский инженерно–строительный институт им. Куйбышева) (26, Yaroslavskoye Highway) in 1955. 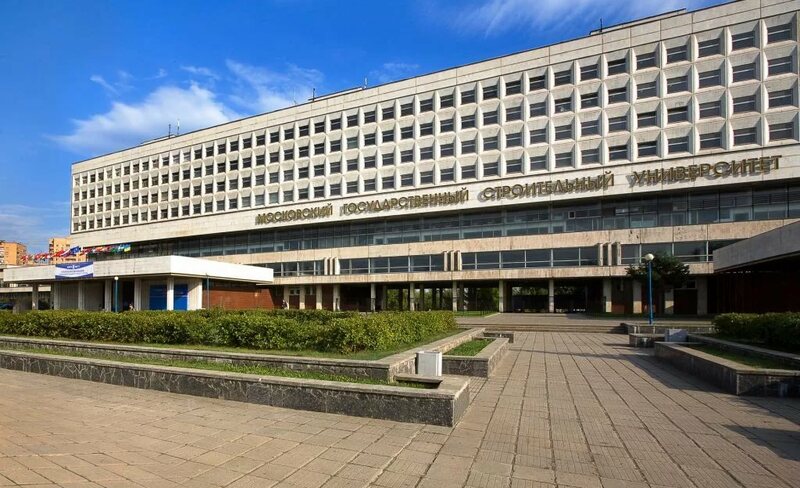 Today, this institution is known as the Moscow State University of Civil Engineering. The hotheaded young man, however, dropped out after one semester; the story goes that he poured drafting ink or coffee over a completed assignment on New Year’s Eve just before the start of the winter session, declaring that he would enroll in a drama school. 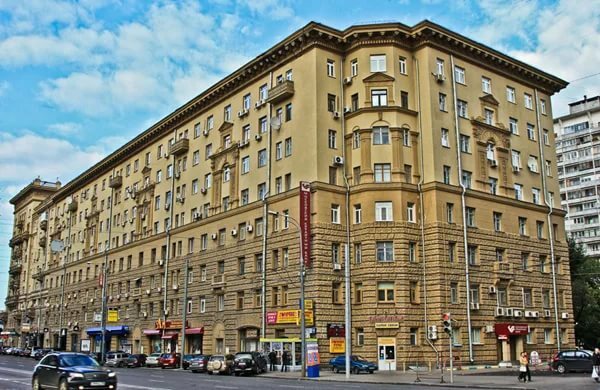 Between 1955 and 1963, Vladimir lived with his mother Nina Maksimovna first at 126, Meshchanskaya Street, and later in a new building built in the same place (Apartment 72, 76, Mira Avenue). 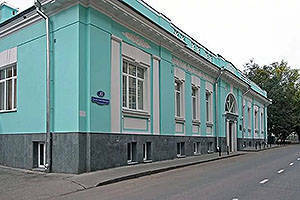 He kept his promise and enrolled in the Acting Department of the MAT Studio-School (6c7, Tverskaya Street). In 1959, Vysotsky was cast for the first time, in the role of Porfiry Petrovich in the student performance of Dostoyevsky’s Crime and Punishment. In the same year, he was cast in a minor film role in The Yearlings (Russian: Сверстницы). In 1960, Vladimir Vysotsky joined the Moscow Pushkin Drama Theatre (Russian: Московский драматический театр им. А. С. Пушкина) (23, Tverskoy Boulevard), where he worked until 1964. 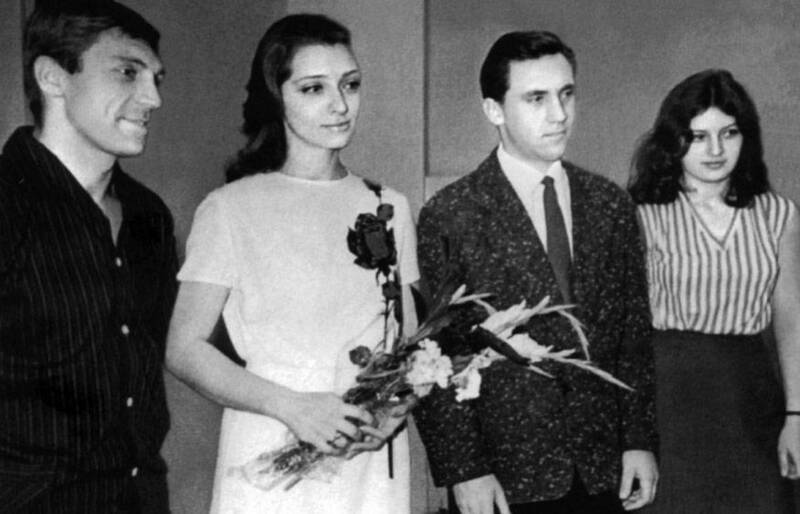 In spring of 1960, Vysotsky married Iza Zhukova, but one year later he met Lyudmila Abramova, who became his second wife and the mother of his two sons, Nikita and Arkady. Years later, Lyudmila Vladimirovna said in an interview that Vysotsky never simply left a woman, he would always leave her for someone else. 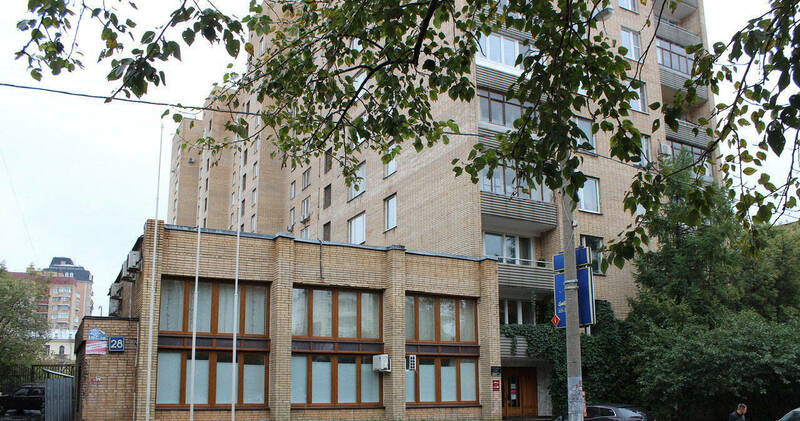 At the end of 1963, the Vysotskys moved to a new building (Apartment 41, Block 4, 11, Shvernika Street). This building was demolished in 1998. Five years later, the songs that he wrote for The Vertical and his own starring role in this film won Vysotsky immense popularity throughout the Soviet Union. Vladimir Vysotsky was very confident in himself and knew his own talent. Like many other Soviet moviegoers, he saw The Sorceress, a French film starring the charming Marina Vlady, and declared that he would marry her. 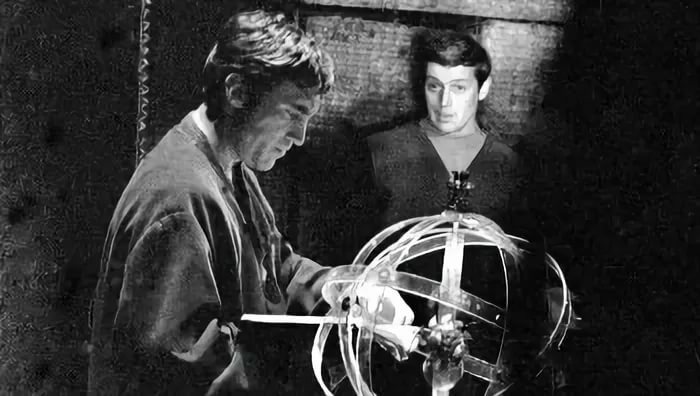 There was a gaping abyss between the Russian actor and the foreign film star, and everyone took this as an absurd joke, but Vysotsky had in fact predicted his destiny. Something unbelievable happened: in 1967, Marina Vlady arrived in Moscow to participate in an international film festival and was invited to attend a show at the offbeat Taganka Theatre (76/21, Zemlyanoy Val Street). 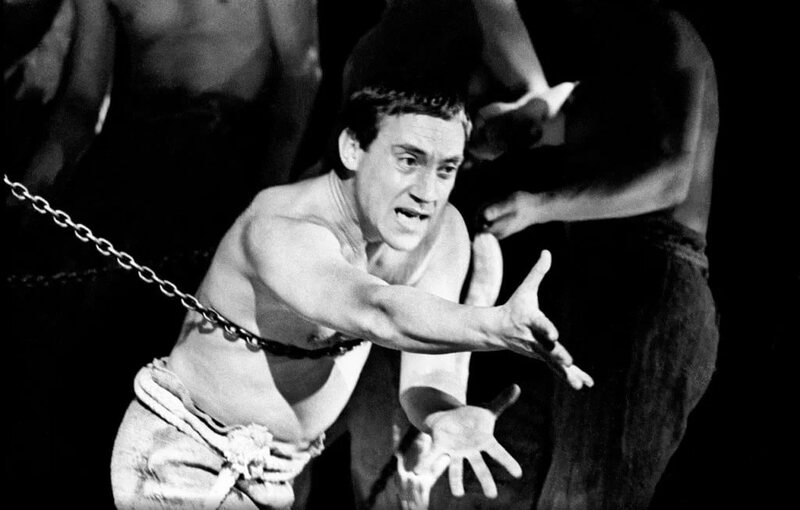 A chained titan with a stentorian voice was raging on scene in a production based on one of Sergei Yesenin’s works – this raging titan was none other than Vladimir Vysotsky in one of his many acting roles. His performance so greatly impressed Vlady that she agreed to meet the young actor. 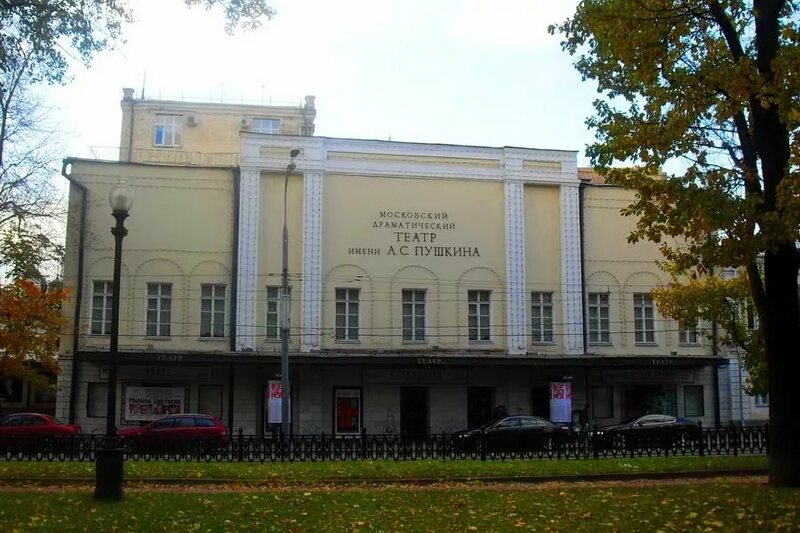 Vysotsky joined the Taganka Theatre (Russian: Московский театр драмы и комедии на Таганке) in 1964 after a short stay at the Moscow Theatre of Miniatures (Russian: Московский театр миниатюр) (16, Pervaya Tverskaya-Yamskaya Street) and an attempt to join the Sovremennik Theatre (17, Chistoprudny Boulevard). Yuri Lyubimov, the director of the Taganka Theatre, later remembered that Vysotsky had come to him with a guitar and played him some of his songs. His performance was so touching that it was as if it had been Vysotsky’s last chance to be heard. Astonished, Lyubimov decided to hire this singular young man and later turned a blind eye to all his sudden disappearances, including the many which were related to Marina Vlady. The very night Vysotsky met Marina Vlady, he found a way to be alone with her and sang for her, seated with his guitar at the feet of the ‘sorceress’. Vlady, who was the daughter of Russian emigrants, had trouble grasping the meaning of the Russian words, but she understood right away that she saw, in front of her, a true poet. She wrote Vladimir, or the Aborted Flight, a memoir of her relationship with Vysotsky. They did marry, despite all the obstacles in their path. 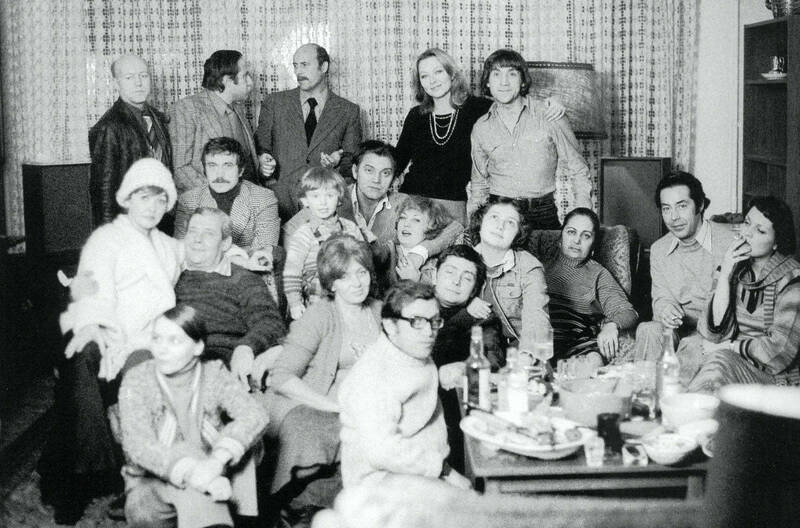 Vladimir’s friends and acquaintances treated Marina Vlady coldly, hating that Vladimir adopted refined manners when at his wife’s side and in so doing, ceased to be one of them. Marina could not live in the Soviet Union, since she was too connected with France. As for Vysotsky, he refused to leave his homeland, hence the frequent separations, telephone calls, rumours, misunderstandings and scandals. 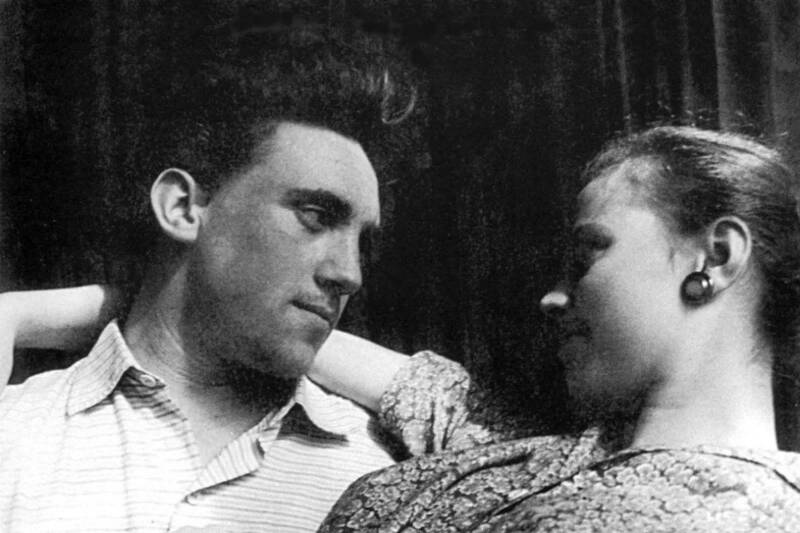 Through their passionate relationship, however, the main goal was to make Vysotsky an officially recognized poet and singer – their immense love for each other helped them overcome all the obstacles. Vladimir Vysotsky and Marina Vlady married at the Griboyedov Civil Registry Office (10, Kharinoyevsky Lane) on 1 December 1970. They went on a cruise aboard the luxurious boat Gruzia, and their fans arranged them a wedding banquet in Tbilisi. 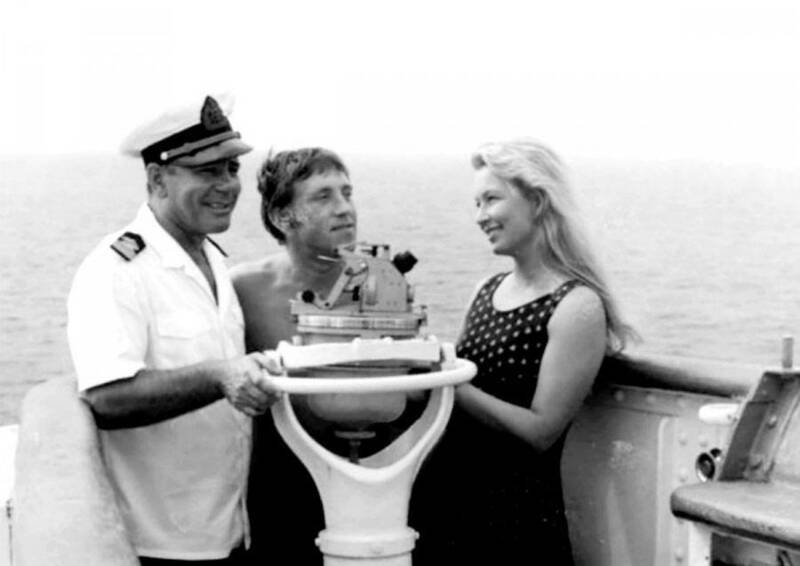 Three years later, Vysotsky obtained his international passport by virtue of his marriage and was authorized to go abroad. This opportunity to make trips to Poland, Germany, France, the USA, Mexico and Italy to perform for Russian audiences abroad and to see how people from all over the world responded to his songs was a real source of inspiration for him. 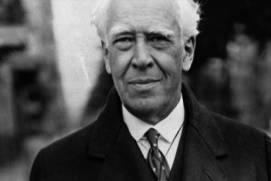 In Russia, he was denied the right to become a member of the Union of Composers and the Union of Writers, but his influence on international audiences consisting of millions attenuated the bitterness of not being able to be recognised in his homeland. Wherever Vysotsky was, he always hurried to his beloved Russia, and especially Moscow. He said in an interview that he would never have become what he was without the Taganka Theatre; working with director Yuri Lyubimov was a turning point in Vysotsky’s acting career. He starred in The Dead and the Living, Galileo’s Life, Ten Days That Shook the World, Crime and Punishment, The Cherry Orchard and many other plays. Vysotsky wrote many songs for particular theatrical productions. 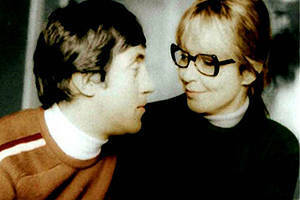 Those who did not have the opportunity to see Vysotsky on stage knew him from his work on films. His cinema roles are few, but memorable, including Two Comrades Were Serving, Taiga’s Master, Dangerous Tour and and Little Tragedies. These are classic films of the 1960s and 1970s. Vysotsky’s easily recognizable voice can be heard in Our Sons Are Going into Battle, The Wind of Hope, Ivanhoe and many other films. Along with the heritage of world-famous people and great museums, there are many attractions in Moscow, which are not so popular, but still very remarkable. 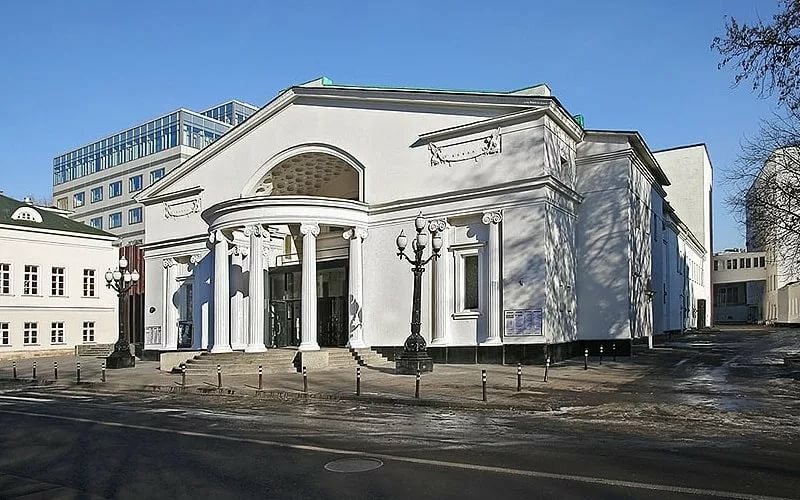 Beautiful temples in the Orthodox style, the unusual architecture of the Russian Middle Ages or the recent Soviet era, ballet and drama theaters – information about it you can find on our website. 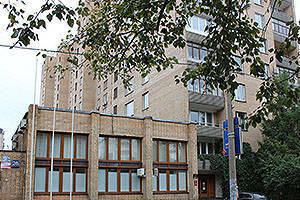 In 1975, Vysotsky purchased a large coopapartment at No. 30 at 28, Malaya Gruzinskaya Street. All he needed to work were a table, a lamp, a piece of paper and a white wall to look at. Marina Vlady remembered in her memoirs that her husband lived his life to the fullest: theatrical performances, concerts in various cities and towns, film shoots and poetry writing took up all of Vysotsky’s time, leaving him only four hours of sleep per night. “You are bustling with activity”, Marina wrote in a letter to him. It was Vlady who had to make supreme efforts to bring Vysotsky back to life, when in summer 1969 he almost died due to severe bleeding from his throat. The ambulance refused to take care of what they saw as a non-transportable case, but Marina insisted that he be taken to the hospital and seen by doctors at the N. V. Sklifosovsky Research Institute of Emergency Medicine (Russian: Институт скорой помощи имени Н. В. Склифосовского) (3, Bolshaya Sukharyovskaya Square). 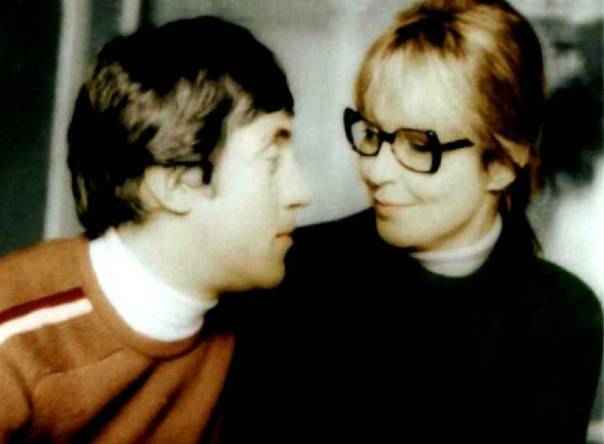 She also had to do her best to save Vysotsky from alcoholism. 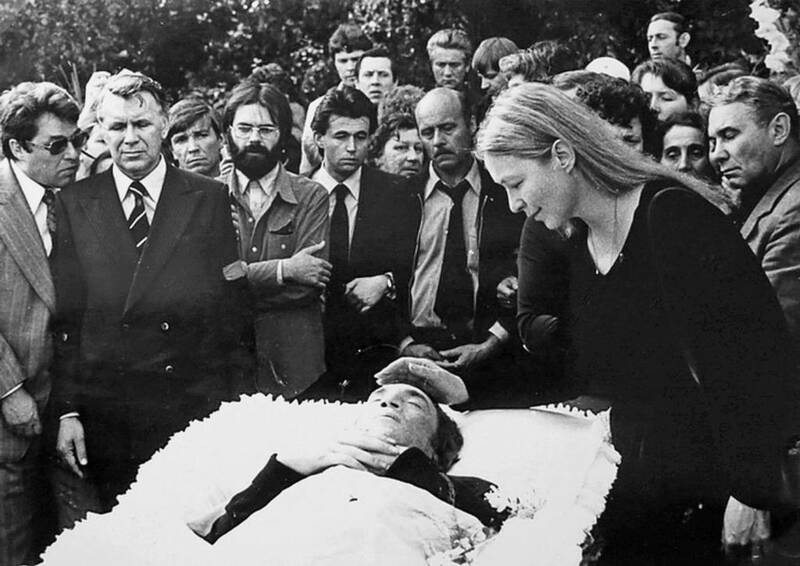 She fought for his health against the wishes of her husband, and both of them were worn out – Vysotsky was ready to sink into despair, but Vlady would never accept it. 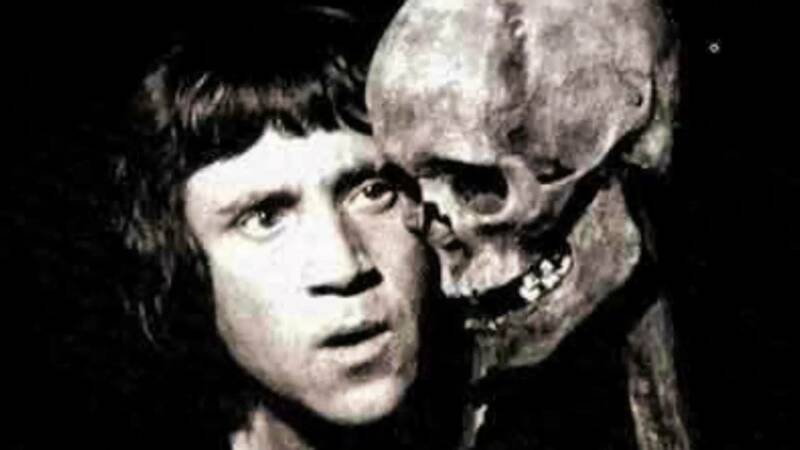 In 1970, Vladimir starred in his favourite role at the Taganka Theatre, playing Hamlet. He even dedicated a poem to Hamlet, playing this role a total of 217 times. He starred in this role for the last time on 18 July, 1980. 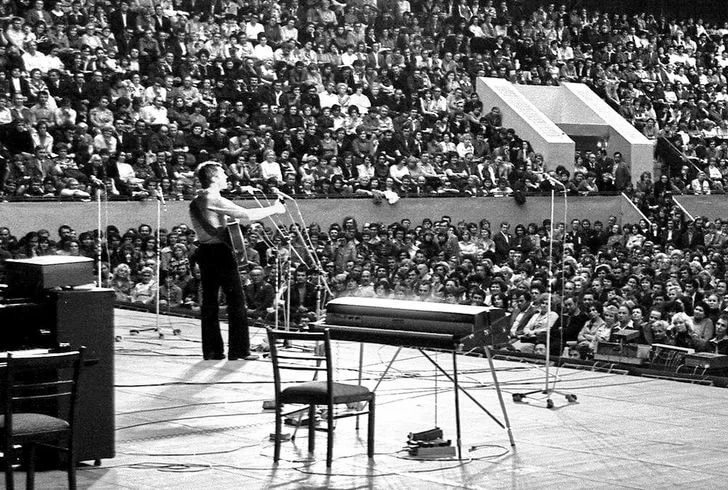 The day before that, he gave a concert in the town of Korolyov (then Kaliningrad) near Moscow. By that time, Vysotsky had authored some 600 songs and 200 poems. 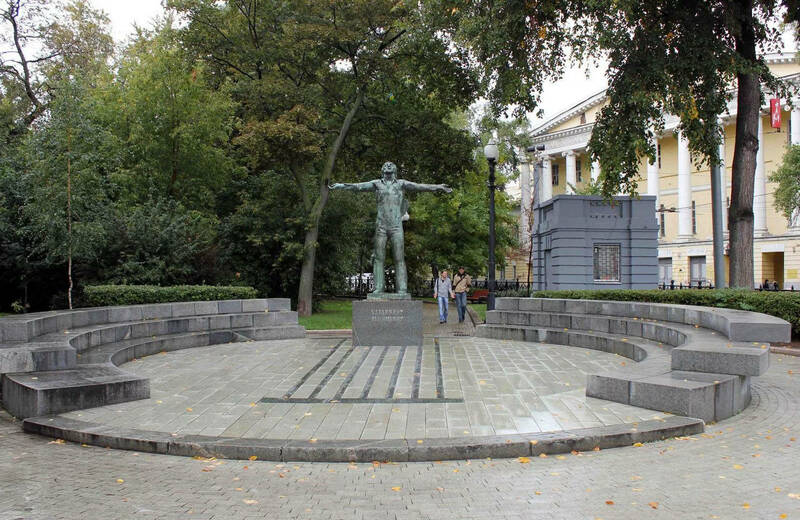 He seemed to anticipate his death – in 1979, he almost refused the leading role in Stanislav Govorukhin’s The Meeting Place Cannot Be Changed, feeling he was not strong enough to accept it. He did in the end take the role, and Russians still enjoy watching this film with Vysotsky in the role of Gleb Zheglov, a charming and daring police captain who shows no mercy to criminals. 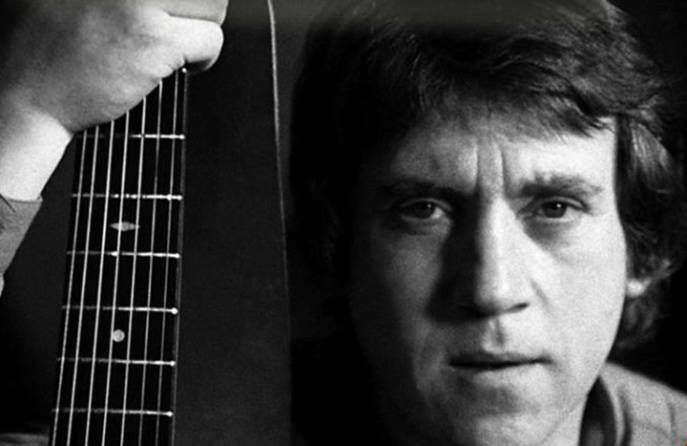 In the summer of 1979, Vysotsky’s heart stopped during a tour in the city of Bukhara. He was revived, but he died one year later. 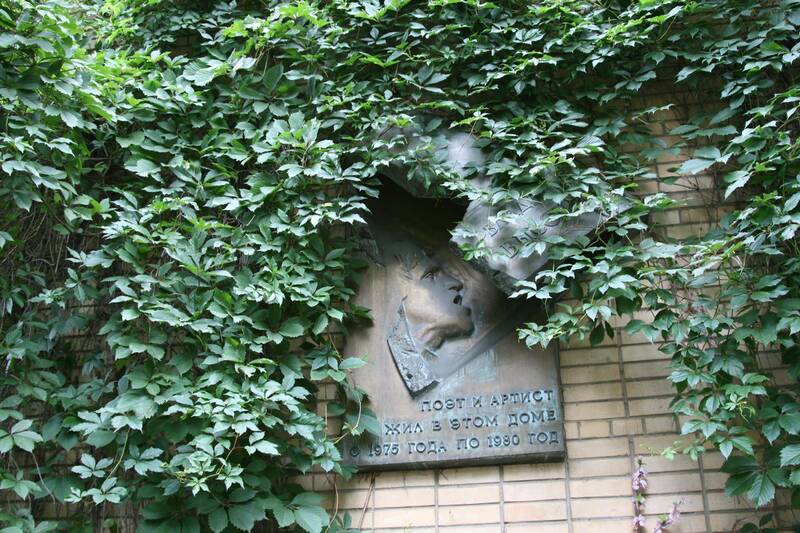 On July 1980, he died of acute cardiac failure in his apartment at Malaya Gruzinskaya Street. Vlady arrived in Moscow with her son Petya, her child from her first marriage (she had no children from her marriage to Vysotsky), and had a mask of her husband’s face made the night before the funeral. 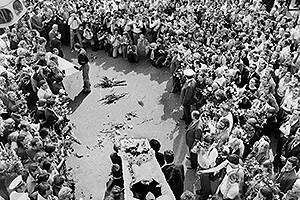 Vysotsky died in the midst of the 1980 Summer Olympics held in Moscow, and it was decided that mourning his death would spoil the mood. Only two newspapers, Vechernyaya Moskva and Sovetskaya Kultura, published brief obituaries. 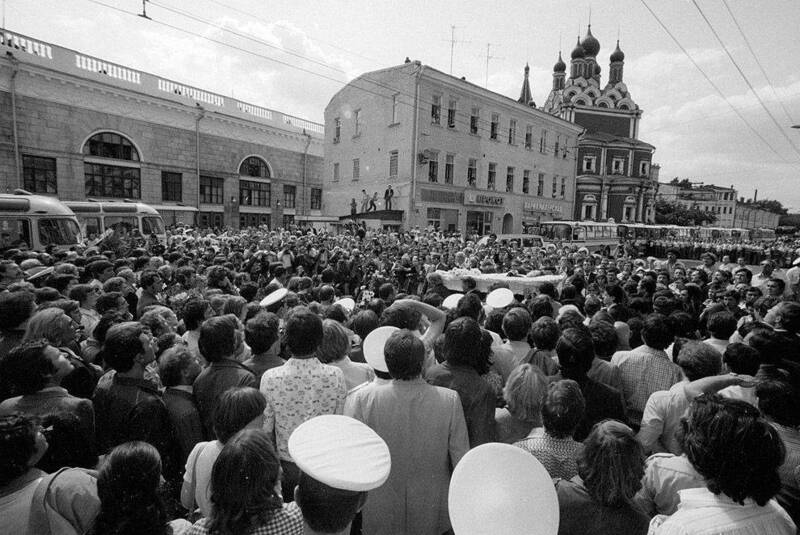 This was enough, however – thousands of Muscovites gathered on 28 July outside the Taganka Theatre to bid Vysotsky a final farewell. 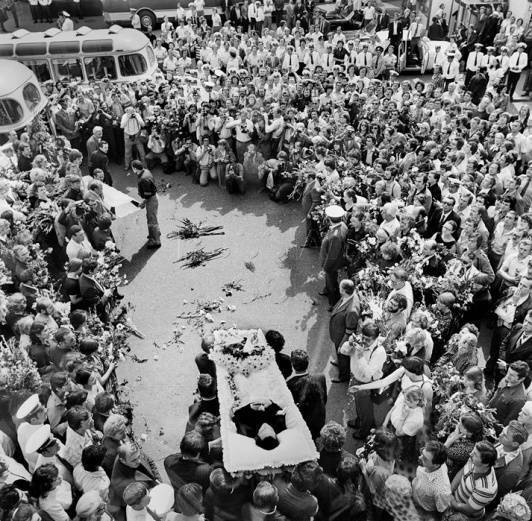 His son, Nikita Vysotsky, later remembered that what he had seen that day came as something of a shock to him; it seemed that everyone in Moscow came to attend the funeral. 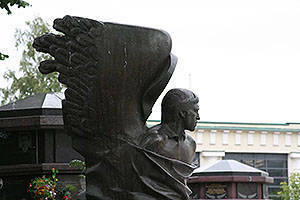 Vladimir Vysotsky was buried at the Vagankovo Cemetery, not far from the entrance (Lot 1, to the right of the entrance). 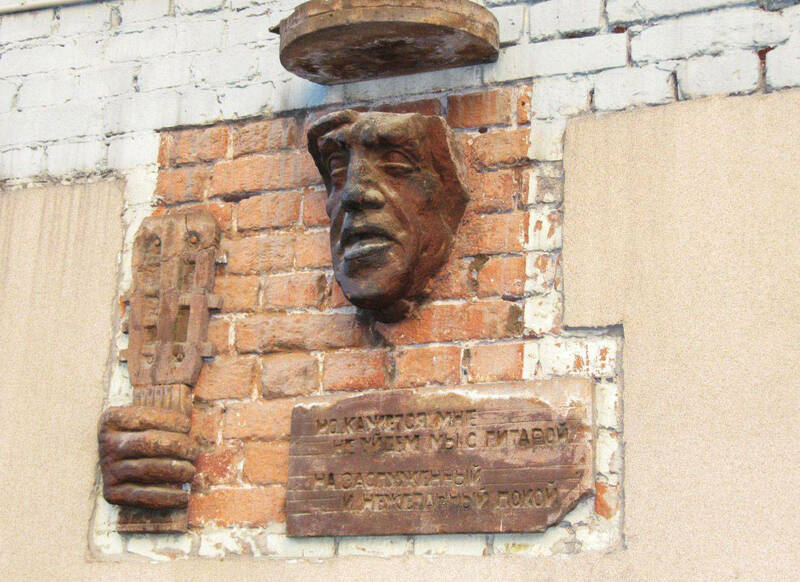 In addition to numerous memorial plaques, monuments dedicated to Vysotsky can be seen on his tomb, on Strastnoy Boulevard (Chekhovskaya Metro Station), at the Taganka Theatre (76/21c1, Zemlyanoy Val Street) and in the courtyard of the Museum of Modern Art (25c1, Petrovka Street). 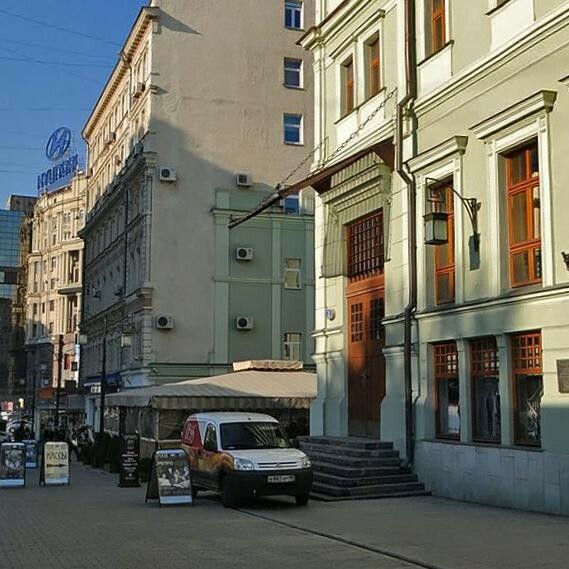 Located at Block 1, 3, Vysotskogo Street is a museum dedicated to his life and creative legacy, Vysotsky’s House at Taganka (Russian: Дом Высоцкого на Таганке). His recordings, films, documentaries and those stage performances that were captured on film is what is left to us – if you happen to hear his voice one time, you are bound never to forget it.